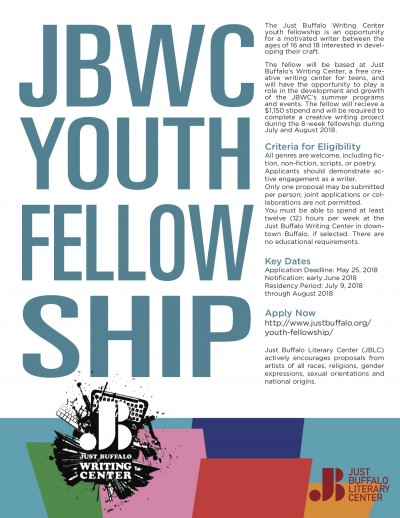 The Just Buffalo Writing Center youth fellowship is an opportunity for a motivated young writer between the ages of 16 and 18 who is interested in developing his or her craft and exploring professional avenues into the literary arts. The fellow will be based at Just Buffalo’s Writing Center, a free creative writing center for teens, and will have the opportunity to play a role in the development and growth of the JBWC’s summer programs and events. The fellow will be offered a $1,150 stipend and will be required to complete a creative writing project during the 8-week fellowship during July and August 2018. All genres are welcome, including fiction, non-fiction, scripts, and poetry. The applicant should demonstrate active engagement as a writer. Only one proposal may be submitted per person; joint applications or collaborations are not permitted. You must be able to spend at least twelve (12) hours per week at the Just Buffalo Writing Center in downtown Buffalo, if selected. There are no educational requirements.